Raised in a family of contractors, Carmen Ciricillo jokes that he was Port-o-Pottytrained at the age of two and that his first words were "no free estimates." Yet, Ciricillo turned down a lucrative career as a construction executive to enter the uncertain world of stand-up comedy. "When I realized construction meant lifting wood at 7 a.m., I opted to become a comedian," says Ciricillo, 85BBA. "The heaviest thing that I ever wanted to carry on a job was lunch." Ciricillo got his start as a UI student booking comedy acts, such as Tom Arnold, for the Iowa Memorial Union's Wheelroom. After winning a Cleveland Comedy Club competition in 1986, he decided to tour nationally and focus his act on what he knew best—construction. 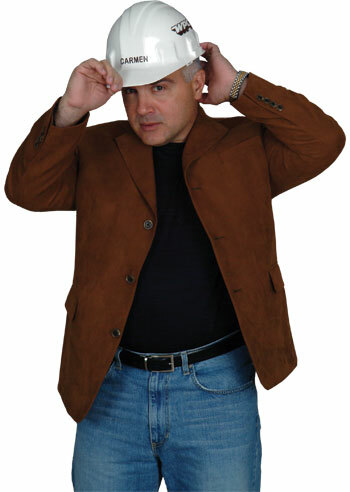 Today, the Construction Comic makes up to 150 appearances a year at colleges, corporations, comedy clubs, trade shows, and for groups such as the National Association of Home Builders. He also livens up continuing education classrooms as an instructor of seminars required for Florida's licensed contractors. Though Ciricillo has appeared in national TV commercials, as a regular on the Discovery Channel's Your New House, and had a sitcom pilot written based on his routine, the Construction Comic says nothing compares to the thrill of performing before a live audience. His act usually revolves around sluggish workers, careless contractors, and fussy clients, although he also does personal revelation comedy about his life as a husband and father of three. Ciricillo has broadened his appeal as he reaches beyond construction for inspiration. Recently, he has participated in a NASCAR comedy tour and sold jokes to The Tonight Show with Jay Leno— although his biggest dream is to make David Letterman laugh. Now in the business for more than 23 years, Ciricillo never regrets his decision to trade in his toolbox for a microphone. "When you have a passion for something, it's painful not to do it," he says. "I needed courage [to leave construction behind], but once I got on the stage, I conquered my fear. I was hooked, and now I can't let go."